In Conversation with Illustrator of “The Road Not Taken”, Vivian Mineker! Vivian is joining us from Ljubljana, Slovenia to talk about her latest book from FamiliusPublishing – The Road Not Taken. We were delighted to speak to her on various topics including her work, her experience on working with Familius on The Road Not Taken, how she brings her stories to life, ideas and perspectives, techniques and inspiration! Tune and follow the journey of a young boy as he goes through life always reflecting on the road not taken. Vivian Mineker is a Taiwanese American from Taipei and Portland, OR, currently living in Slovenia. She works as a freelance illustrator. Her style is a bit quirky, fun, and sweet, with a modern feel. Her process usually starts with watercolor and colored pencils and finishes on the computer for fine details and adjustments. She’s always loved to draw and make up stories and characters, so it’s been a wonderful journey getting to the place where she is now! Finally, where can we find more about Vivian? 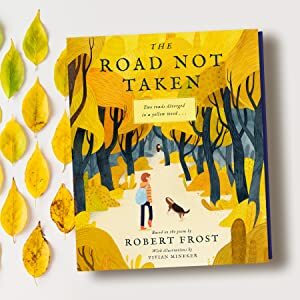 For all of life’s adventures comes this beautifully illustrated companion inspired by Robert Frost’s perennial poem “The Road Not Taken.” Heartwarming illustrations of a young boy journeying through a yellow wood accompany the original text of the poem. When a fork in the road arises for the boy, so too does the first of life’s many choices. And as the poem progresses, so does the boy’s life: college, career, marriage, family, loss, and, by journey’s end, the sweet satisfaction of a life fully lived. The first children’s book ever made of Frost’s famous poem, this moving presentation makes an inspiring gift for graduation, marriage, career moves, and all of life’s exciting roads. The Road Not Taken is available for pre-order on Amazon! When did Vivian realize that she wanted to spend her life drawing? Where does she find her inspiration for new stories and characters? And how does Vivian keep on top of all her thoughts and ideas? How does she motivate herself if she’s often traveling and working — how does she focus on the working part of that? What is she working on at the moment? Vivian, you rule. Thanks for doing this interview, best of luck with your amazing missions!